A is for Arugula (Corn & Orzo Salad with Arugula Pesto) | eat. cook. blog. I am on the wellness committee at my work. It was started as a program called Be Well through our insurance broker (you know…healthy employees are more productive, cost employers less money, cost insurance companies less money and eventually, hopefully bring down the cost of premiums employees pay). So the committee’s mission is to organize fun, educational activities/events/competitions to encourage our coworkers to get more healthy. We did a segment called “Five for Five” where we were to eat five servings of fruit and vegetables every day and teams kept track of their healthy eating habits and winners competed in a “fruit off” contest (don’t ask) at the end. We had another competition where we added up all the steps we took in a day. We did a segment on stress reduction which has led to having yoga instructors come in and offer free yoga classes on a weekly basis! The most recent wasn’t a competition, just an educational activity, called “Healthy Eating A-Z”. Committee members divided the alphabet and were responsible for finding a healthy whole food that starts with that letter, researching it, finding a recipe and sending an email to all employees. It was so popular, that everyone was asking us to compile a cookbook. We did and then we had a healthy lunch potluck. And that was so fun that we’ve been asked to plan another one. I volunteered to take letter “A” and chose Arugula as my ingredient. 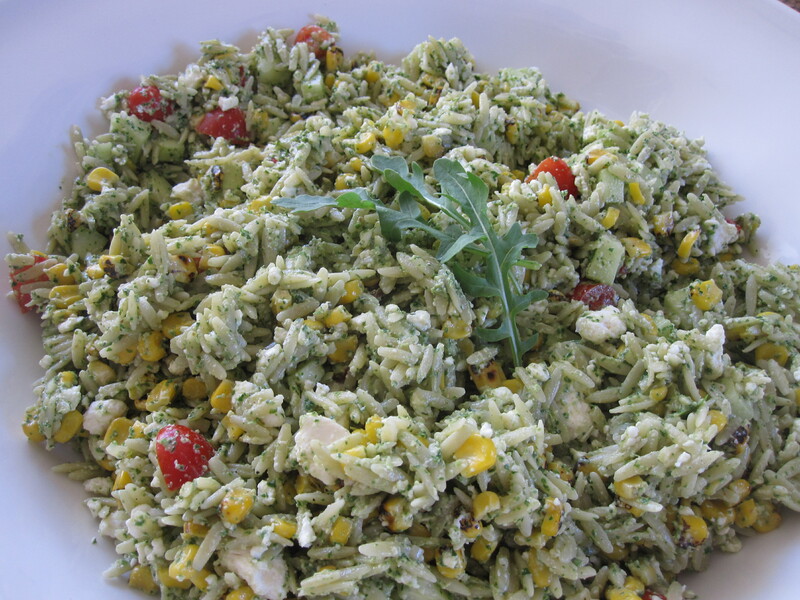 I had actually made this really delicious Corn and Orzo Salad with Arugula Pesto not too long before. Perfect. It’s delicious. 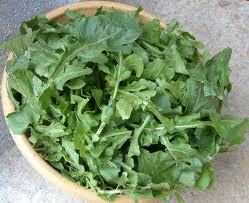 Arugula (Eruca sativa), an edible annual plant, is also known as rocket, roquette or rucola. It is used as a leaf vegetable, and looks like a longer leaved and open lettuce. It is rich in vitamin C and potassium. It has been grown in the Mediterranean area since Roman times, and is considered an aphrodisiac. Before the 1990s it was usually collected in the wild and was not cultivated on a large scale or researched scientifically. In addition to the leaves, the flowers (often used in salads as an edible garnish), young seed pods and mature seeds are all edible. It has a rich, peppery taste, and has an exceptionally strong flavor for a leafy green. It is generally used in salads, often mixed with other greens, but is also cooked as a vegetable or used raw with pasta or meats. In Italy, arugula is often used in pizzas, added just before the baking period ends or immediately afterwards, so that it will not wilt in the heat. Oh, and my other letters were “H” – Honey (in Everyday Granola); “O” – Olive Oil (and Dukkah, a middle eastern dish made with nuts and seeds); “U” and “V” – (not sure why those were assigned together!) – Ugli fruit (go ahead, Google it) and Vinegar. 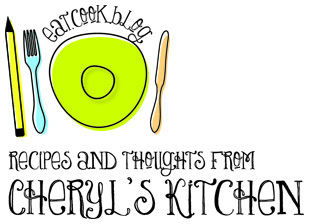 And if you’d like the entire “A-Z Cookbook”, email me (find my email on my Contact page) and I’ll happily email it to you. To prepare pesto, place walnuts in processor and finely chop. Add arugula and parsley; pulse to coarsely chop. With motor running, add garlic, oil, lemon juice, cheese, salt and pepper and process until blended. To prepare salad, cook orzo according to package directions. **if using frozen corn, pour the still frozen kernels into colander. Then, when the orzo is finished cooking, pour the pot of orzo directly over the corn to drain. This will defrost the corn. ** Drain the orzo and corn, rinse under cold running water and drain well. Transfer to a large bowl. Add corn, pesto, cucumber and tomatoes and mix gently. Stir feta in just before serving. Great recipe–on the menu for us..